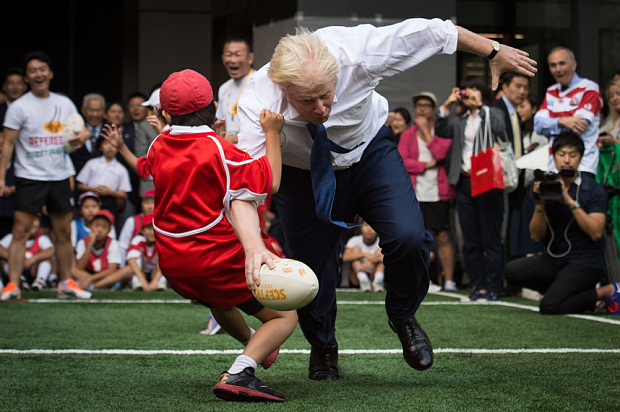 The video of London mayor Boris Johnson bowling over a 10 year Japanese boy while playing rugby is, quite rightly, doing the rounds. No wonder, the mayor displays truly terrible technique, carrying the ball nonchalantly in his right hand, thus making it easy for the would-be tackler coming from his right to dislodge the ball. No, clearly Johnson should have been carrying the ball in two hands before tucking it under his left arm to free his right hand for the fend. Johnson's inability to execute basic skills cost his team a try and is indicative of the current malaise in the English game. Got to say, I loved the way he sold that side step then just nailed the kid square on. The tackler here could teach that Japanese centre who got squished by Alesana Tuilagi how to get his head on the right side of the ball carrier.